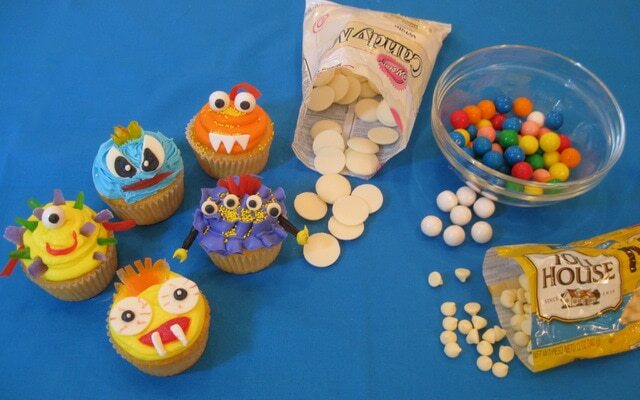 Okay, so I’ve been wanting to do a tutorial on monster cupcakes for a while now–and today is finally the day! The rules are…there are no rules (I’m having a flashback to “Grease” as I say this.) — But truly, no rules–because monsters aren’t supposed to look like anything in particular–just a random mix of fur and eyeballs and teeth and tongues—-so, let’s have at it! My monsters have yummy eyeballs—today, I used a combination of Wilton candy melts, white gumballs (Sixlets chocolate candies would be great too), and white chocolate chips. Marshmallows are always a good choice too–The pupils are dots of black buttercream. 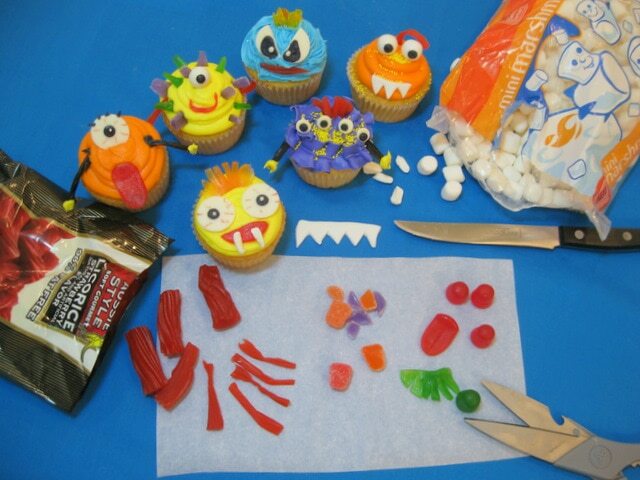 Next, we’ll discuss all of the other monsterly features… all you need are scissors or a knife, and lots of candy! I used mini marshmallows or fondant for the teeth. I also sliced and snipped lots of gumdrops , licorice and Dots candy to make fun spikes, hair, arms, etc. AND, for the tongues–Dots candy that I rolled out with a rolling pin (very easy). Today, I ate a lot of monster parts. Creating the monster fur and bodies gives you a chance to use your favorite piping tips…as well as those funny looking ones that you’ve never used but always wanted to…. Back row from left to right: Wilton tip 81, grass tip 233, leaf tip 67. Front row: tip 21, tip 12/tip 8PT (large). These are all frosted in vanilla buttercream! Okay, let’s round up this rowdy bunch for a group photo. I decided to let one of the monsters hold the birthday sign….and the candles are anchored by Dots candy (although small balls of fondant are great for this also!) 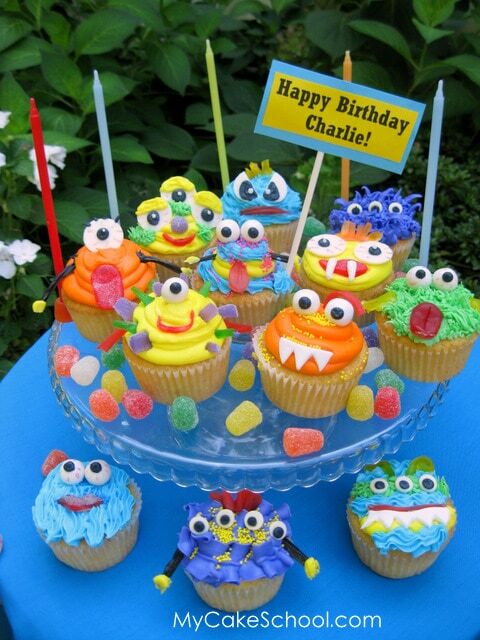 Remember, monsters aren’t just for Halloween–they bring smiles all year round—and they taste good too! These are absolutely adorable. 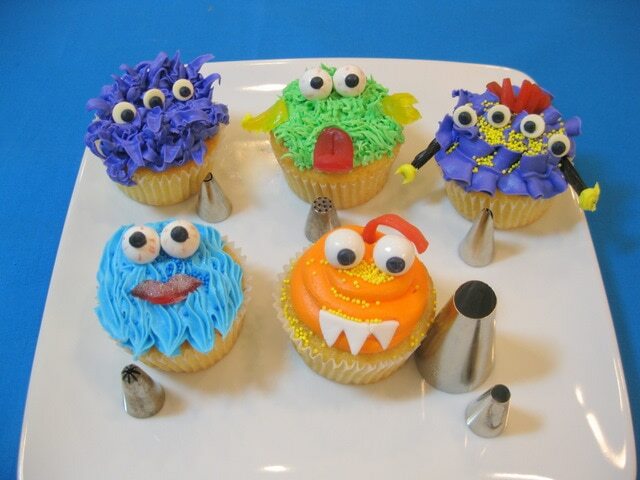 I have never made monster cupcakes before but this makes me want to now. I love how there are no rules and you get to decorate with candy…so fun! Love all the different decorating tips you used and all the vibrant colors! Oh how fun!! These would be perfect for Halloween!! OH.MY.GOODNESS. I’m in love! These are the most darling cupcakes I have EVER seen. I must learn how to make these! You are amazingly talented! Have a blessed day! I just wanted ask how do you achieve the vibrant colours ? 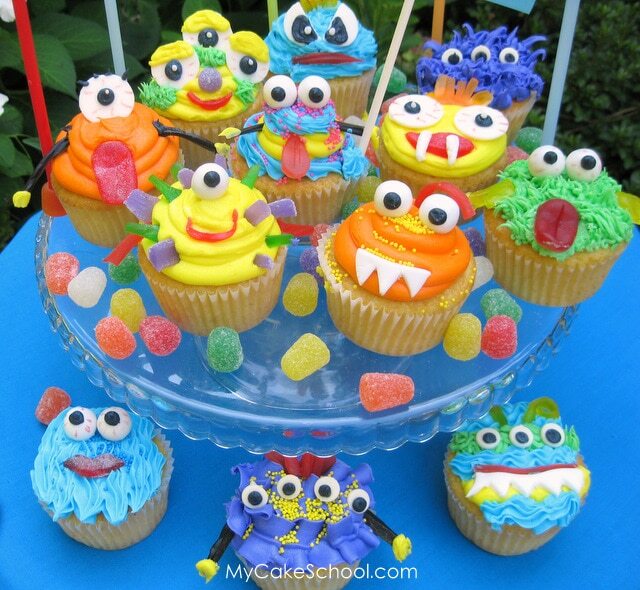 Thanks Selena—I used Americolor gels to make these monsters—-have you ever tried them? They are great for vibrant colors. Hello! These are adorable. I lack in creativity and baking, so I greatly appreciate the explanation of what you used for monster parts. What type of frosting did you use? Hi Lynn! Thanks, these are frosted with vanilla buttercream. These are so adorable! My boys would love them! These are so adorable thank you ! Hi Shilpa–Most recipes for buttercream are fine to sit out for at least a day or two because of the high sugar content. We use a basic crusting American buttercream recipe and this is true for us. If you do refrigerate any butter based frostings, you’ll want to bring to room temp before serving because they get very firm when chilled.